These richest TV pundits are not just ordinary TV personalities. They make TV programs more entertaining with their informative insights. They may not be the most popular or the highest earning TV personalities, but these richest TV pundits have earned their spot in the mind and heart of their programs’ loyal fans. People tune in to their programs because they want to hear about their opinions and insights. These people are some of the best TV presenters, news anchors, or commentators. You could argue that there are others better and richer than them. But those people may not be categorized as pundits. According to Cambridge dictionary, pundit is a person who knows a lot about a particular subject and is therefore often asked to give an opinion about it. In other words, even though they host TV programs, their opinions matter as much as the guests’. This fact comes from their past experiences in the field or simply by hosting the program for quite some times. So, we ranked them based on their estimated net worth today. Please note that these numbers may not reflect their overall earning as TV pundits. Anyway, let’s start the countdown! Tennis matches are proven to be one of the best sport platforms to advertise. For at least one hour straight, all eyes are on tennis players swinging their rackets for points. From sportswear to luxury wristwatch, those sportsmen and sportswomen are sporting them well. Check them out on the luxurious tennis watches worn in action and most expensive tennis players’ accessories articles. However, tennis matches can be dull without the right commentators on board. This is where people like Jim Courier is needed. He has served as a tennis analyst and commentator for many top TV networks. Among them are USA Network, NBC Sports, TNT, ITV, and Sky Sports. And since 2005 until today, Jim is the head commentator for Australian Open on Seven Network. 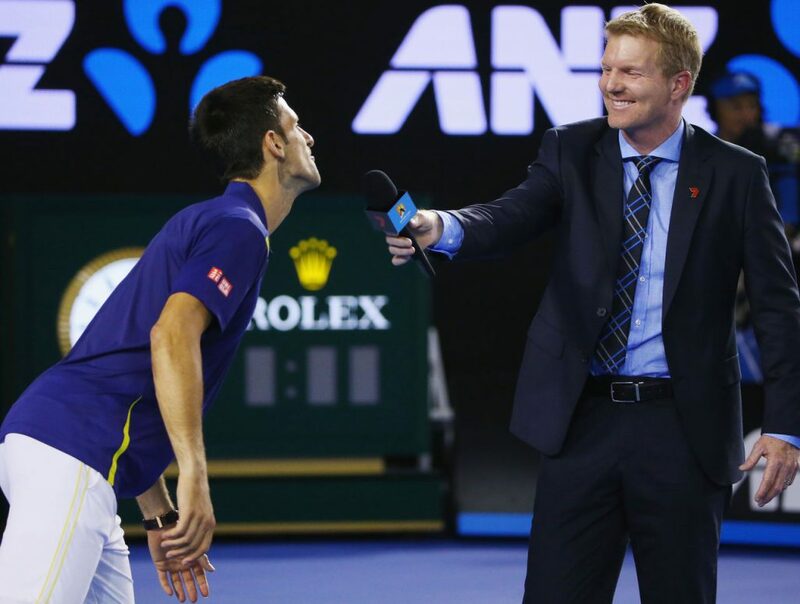 Besides commenting all center court men’s singles match and giving his analyses before and after, he also conducts the post-match on-court interview. One of the moments with Novak Djokovic was captured on the photo above. Jim himself was a professional tennis player. In fact, he is a former world number one. He has won four Grand Slam singles titles: two at French Open and another two at Australian Open. No wonder his insights are so informative, right? Jim Courier’s estimated net worth in 2016 is somewhere around $15.5 million.